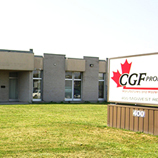 Welcome to Canadian General Filters Ltd or CGF Products. For more than 65 years CGF has designed and manufactured a full line of efficient and reliable residential indoor air quality products. Canadian General Filters Ltd has supplied the industry with an extensive range of quality products intended for use by the trade professional. All our products are available through Heating and Air Conditioning, Refrigeration and Plumbing Wholesalers across Canada. We invite you to explore our site and our products. If you would like more information on any of the product lines we carry, please contact us or visit the Manufacturers website by clicking the link on each product page. Check out the latest version of the IAQ Review!